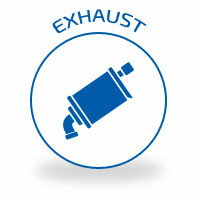 Your vehicle’s exhaust system keeps your engine running clean and efficient. As gases are burnt in the engine, the combustion in the engine expels them out of the vehicle through exhaust pipes. Various components, including the exhaust manifold, catalytic converter, and muffler, make up the exhaust system and allow the engine to run efficiently, cleanly, and quietly. If your vehicle sputters and makes lots of noise as you drive, or you notice a decrease in engine performance or a fall in miles per gallon, consider having the exhaust system inspected. These issues can signal a problem in the exhaust system. You also have the option to upgrade your vehicle’s exhaust with aftermarket options. For increased power and efficiency, or if you simply want the noise of a custom exhaust system, ask our technicians about the options for your vehicle. To help your engine breathe easy and get the best performance, visit Melton Automotive for exhaust system services! From exhaust system repair to installing aftermarket components, our experienced technicians will help you select the best service for your vehicle. Call for more information: 205.663.6088.